I have been taking lessons with Adrienne Brown since July of 2012. I find her to be an excellent horsewoman and instructor. She starts training from the ground up, so that any student of hers will be able to care for their own horse when the time comes. Adrienne’s lessons are always fun. We build from the lesson before, but always in a way that is fresh and interesting. My daughter, who is 13, and I take a lesson together weekly. I have noticed over the past few months that my daughter has really come out of her shell at the barn! Adrienne has worked very hard with us to prepare us for getting our own horse. We got lessons on everything horse related from nutrition, to cleaning tack, to basic ground work. I never would have had the courage to buy my own horse if not for her. I am very thankful to have found such an amazing trainer and mentor. I highly recommend her program ! Adrienne Brown is a fantastic trainer and instructor. She never cuts lessons or training sessions short but instead will continue to work with the horse or student until the desired result is achieved. She is calm, patient, and knowledgeable, she truly cares about the horse and student. She created an effective, efficient, and safe plan to get my horse trained and in shape. I can feel a significant and desirable difference in my horse after Adrienne has ridden her. 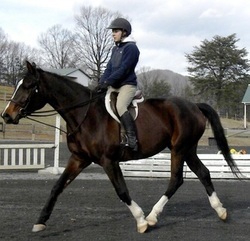 She picks up on the horse and rider's weaknesses and really works on improving them. "Our six year old daughter has been taking riding lessons with Miss Adrienne since 2011. We are delighted with her service! She is extremely patient and excellent with children. 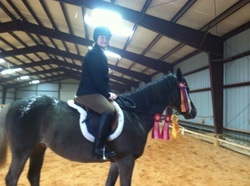 I would highly recommend her as riding instructor for any age." 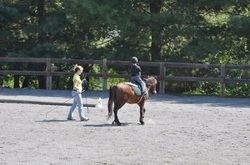 Adrienne is a patient and caring riding instructor, with a focus on safety and true horsemanship. My five year old learned to be confident around horses and enjoyed the games Adrienne played in the ring to teach him how to ride. Not only did she focus on all of the important aspects of riding out in the ring, such as proper balance, attitude and safety practices, but she taught him tons of stuff in the barn before and after each riding lesson. Cyrus learned interesting facts about horses, such as names of body parts and different colors, and the different parts of all his tack. He learned to enjoy grooming and caring for his lesson pony and he mucked stalls and cleaned his tack. As a result of his barn time with Adrienne and Piper, Cyrus now enjoys a special bond with "his" pony. Cyrus has an ongoing interest and appreciation for horses that he didn't have before he took lessons with Adrienne.